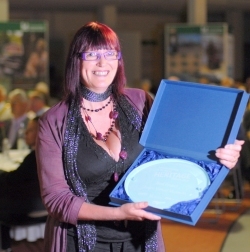 Quorn Virtual Museum won the Best Project category of the Leicestershire and Rutland Heritage Awards 2010. The presentation was made at a special awards ceremony at Snibston Discovery Park in July. Sue Templeman, who collected the award on behalf of the museum team said “We are absolutely thrilled! We get lots of great feedback, but having our work recognised in this way is a real boost”. The team received a plaque and a cheque for £100. The museum was congratulated on the range of artefacts and the innovative ways in which it reaches such a wide range of people. Quorn Virtual Museum was developed and is run by volunteers Sue Templeman and Kathryn Paterson. A lack of permanent premises led them to develop a virtual museum on the Internet. Artefacts have been contributed by Quorn villagers, local organisations, local historians and people connected with the village who have moved away or who had relatives in Quorn. To date, the site contains over 1000 artefacts including old postcards, school photos, parish magazines, newspaper cuttings, Roman coins, WW1 and WW2 information, aerial photographs and a wealth of other information. The site is fully searchable, and where information is missing or uncertain, people are encouraged to contribute their knowledge. Being on the Internet, the museum is "open" throughout the year and is accessible to a truly worldwide audience. If you have any photographs or items that may be of interest to Quorn Virtual Museum, the team would love to talk to you. Items can be scanned or photographed and then returned. Use the contact us page to contact the museum team. The photograph shows Sue Templeman receiving the museum award.